"Your alliance will be a disgrace . . . Are the shades of Pemberley to be thus polluted?" After the excitement of recent adventures (as related in Pride and Prescience and Suspense and Sensibility), Elizabeth and Fitzwilliam Darcy retire to the peace and quiet of Pemberley as they await the birth of their first child. First, a mysterious letter from the late Lady Anne Darcy is discovered—propelling Elizabeth on a quest to learn more about Darcy's deceased mother and an unsettled matter she left behind. Then a summons to Northanger Abbey involves the young couple in an intrigue that threatens not just the Darcy family name, but Darcy's freedom as well. And just when it seems their situation could not grow worse, Darcy's overbearing aunt, Lady Catherine de Bourgh, takes up residence at Pemberley. "Bebris provides another feast for Janeites in . . . this well-told tale." "Bebris captures Austen's style and the Regency period perfectly, drawing her characters with a sure hand. Her plot is poignant and gentle and will appeal to readers who prefer their mysteries without murder or violence." "A new Mr. and Mrs. Darcy mystery is always cause for celebration in this household—and the latest adventure featuring the amatuer sleuths is well up to Carrie Bebris' usual high standard. . . . A terrific read: I devoured it in a single sitting." "An utter delight . . . every aspect is pitch-perfect." "The writing is crisp, dryly humorous, and consistent with Austen's style. This book is the best of the three mysteries so far. It is tightly and credibly constructed down to the last detail, heavy on danger and intrigue, historically accurate, and engaging." People often ask me where I get ideas for my stories. 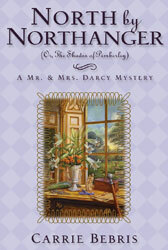 North by Northanger (Or, The Shades of Pemberley) has a double plot, and for the first I confess that I'm beholden to none other than Darcy's aunt, Lady Catherine de Bourgh. (Not someone to whom one wants to owe a favor, but there it is!) Those familiar with Jane Austen's Pride and Prejudice will recall her expression of outrage at the possibility of Mr. Darcy's marrying Elizabeth: "Are the shades of Pemberley to be thus polluted?" Lady Catherine was, of course, referring to the venerable shade trees of the estate's extensive woods. But "shade" can also mean "ghost," and as I thought of Elizabeth assuming her new role as mistress of Pemberley, I imagined that an ancestral house as great and old as Darcy's would have a few ghosts lurking about—metaphorical ones, at least—secrets from the past still influencing the present. Elizabeth finds herself called upon to resolve some unfinished business left behind by Darcy's late mother, and in the process learns more than she ever expected about the family into which she has married. There is, of course, another ancient great house in Austen's novels where a young heroine searches for clues to its past. Northanger Abbey, the setting of Austen's gothic parody of the same name, has a history even longer than that of Pemberley. A mysterious summons to the former convent, now the home of the Tilney family, catapults Darcy on an adventure that eventually sees him teaming up with Henry Tilney as the pair discover that the histories of their two houses intertwine in unexpected ways. Alfred Hitchcock fans will appreciate a few parallels between Darcy's plight and that of the protagonist of the film North by Northwest. Rest assured, however, that my book incorporates neither crop dusters nor a scene with Darcy scaling Mt. Rushmore!